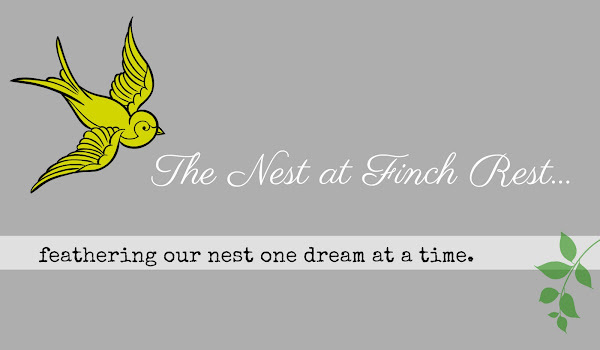 The Nest at Finch Rest: White tulips for White Wednesday! My wonderful DH surprised me with these lovely tulips. White tulips are one of my favvie favs! Aren't they gorgeous? I think I love them most because they just simply match my world, which is neutral everywhere. I love color but cannot live with it, if that makes any sense. I have a few rooms with green and some greige and light purple, but it is done sparingly and not where I much live (laundry, guest baths, guest rooms.) I need like the calm of the whites and the cousins of whites in my world. The throw pillows my daughter made me. 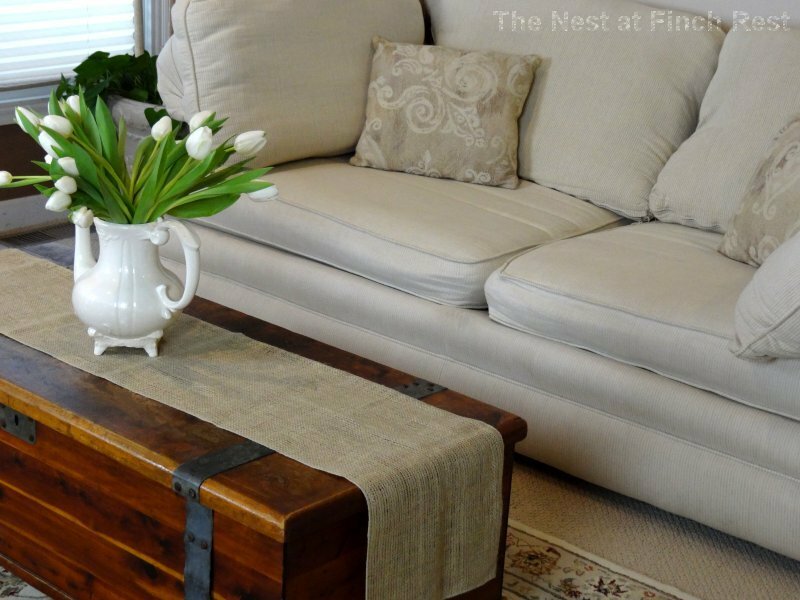 The coffee trunk table was my father's mother's. Burlap runner from Etsy. The custom-made pinstriped sofa is a million years old but I still love it, it still has life left in it, Romeo the kitty loves it - so I haven't had the heart to replace it. The fun vintage ironstone pitcher is an estate sale find. This wool carpet is my very favorite one in the whole house. The little metal end table in the forefront right has a glass and metal tray that lifts off, perfect for serving drinks. The Umbrella Tree in the background I bought ten years ago and it has grown like crazy. It was only around 3 feet tall when first brought home - now it is really tall! You can kinda see a glimpse of one of the architectural columns that "hold up" the loft area in the mantle mirror's reflection. I wish now I would have turned the light on upstairs to show it a little better, but as Winnie the Pooh Bear would say "Ah, bother!" I just love these lovely white tulips that just brighten up this room! Thank you, love! Popping on over to A Faded Charm for White Wednesday! 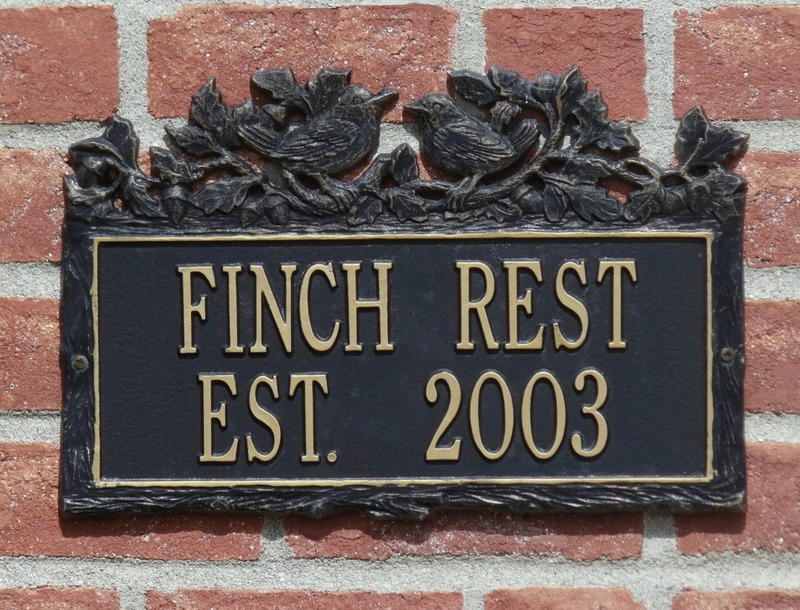 Heading on over to A Delightsome Life for Home and Garden Thursday! Your tulips are so pretty, Michele! If my hubby brought home flowers I'd be wondering what he did! 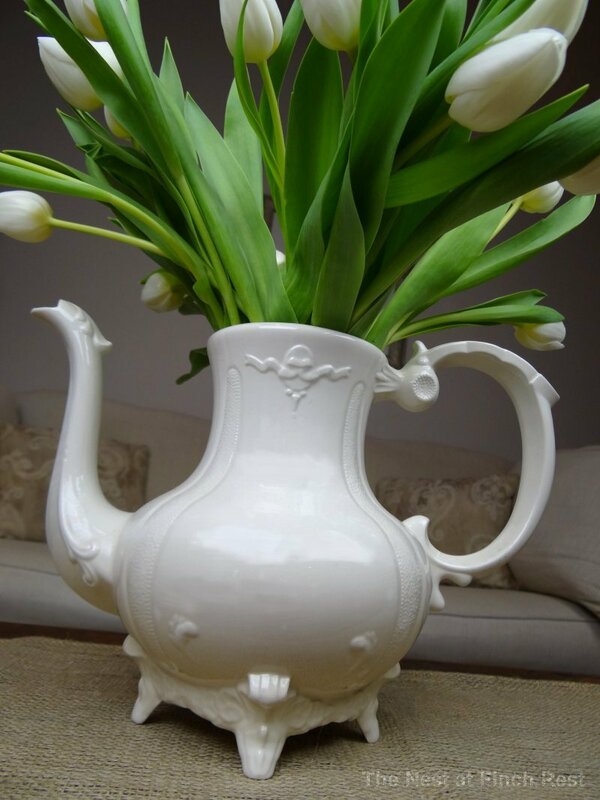 : ) Love the white coffee/teapot ~ what a fun shape and detailing. Gorgeous tulips. Gorgeous teapot. Gorgeous combination. Your tulips make me anxious for Spring to arrive:)! Thank you for stopping by with your kind comments, Michele:). Oh, so pretty! Your living room is beautiful! Lovely post. Love your room! 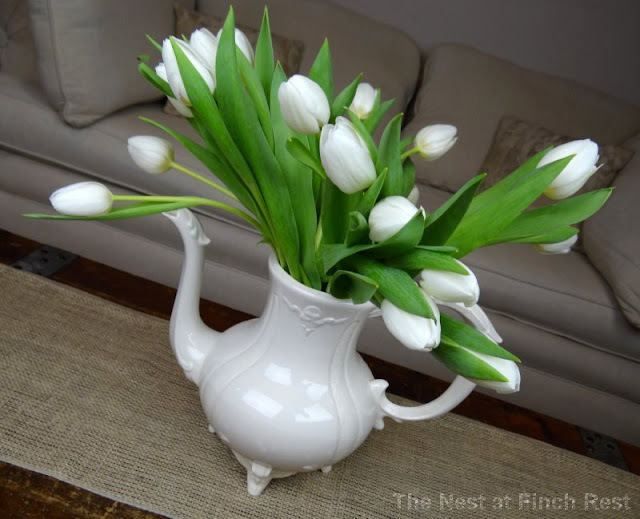 White flowers seem to fit in anywhere and they really brighten up a room ~ tulips are so special. Your living room is elegant. 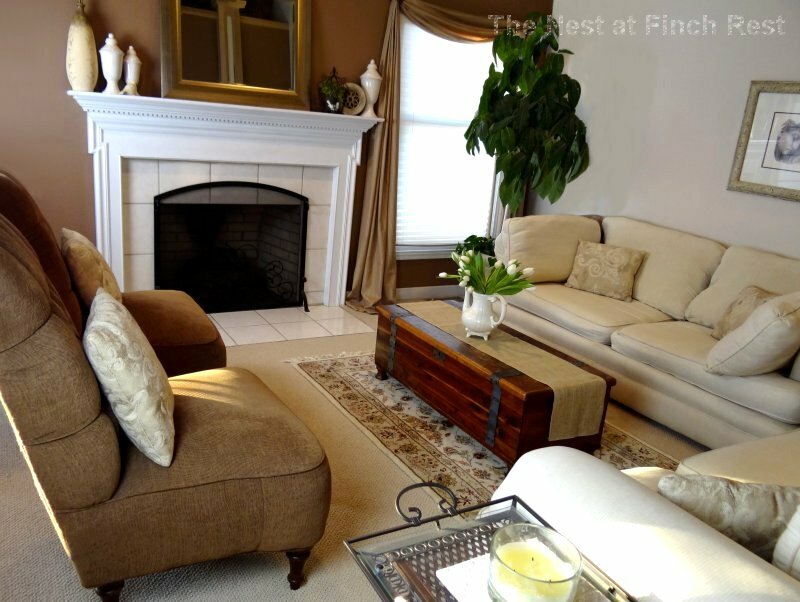 Tulips are my favorite, and they look so beautiful in your lovely living room. I love your beautiful room. Especially like the burlap on the trunk. Your tulips are so lovely...they look amazing in your white pitcher. Those tulips are just luminous! That vase is perfect for them. I like living with neutrals too. Your room is beautiful and serene. Your tulips are so beautiful and romantic looking in that pitcher. I agree with you, I like living with white's and neutrals too. I don't mind a very soft color on the walls but I always seem to feel best in white and other neutrals. Your living room is lovely. Thanks Michelle for your kind words. What a lovely home! I love the pitcher and the tulips. So elegant! White tulips are gorgeous! And so is your teapot. I like your husband already. Now there's a man who knows the way to a womans heart. The tulips are so lovely. What a thoughtful man he is. And you have displayed them beautifully! They are gorgeous! I adore white tulips and all other white flowers! This post truly envokes spring and makes me wish it would completely get here. Thanks for sharing the lovely pics.